Yet another head coach has taken the easy path instead of the high road. Jill Ellis, who will lead the U.S. women’s national team into World Cup qualifying this month, announced her roster on Monday. 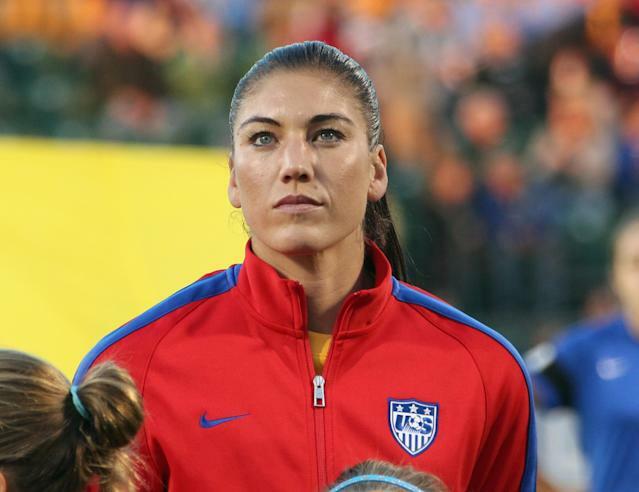 Hope Solo, the star goalkeeper facing trial for domestic violence, is a member in good standing. Nobody should be surprised at this show of weakness. Even though one of Solo’s own teammates, Jill Loyden, wrote in USA Today that the national team “was not living up to its responsibilities” by failing to act in response to the charges, Ellis and the executives above her don’t seem to take those responsibilities seriously enough. Sure, it could be argued that Solo is still awaiting trial. She has pleaded not guilty and her lawyer has said his client is “not guilty of any crime.” It could be argued that striking a 17-year-old nephew and his mother – which Solo is accused of – isn’t as appalling as many of the domestic violence crimes that have plagued the NFL of late. All of that could be argued. What should be argued is that wearing the American colors is a privilege beyond wearing Ravens colors or Vikings colors or Seattle Reign colors, and that honor isn’t earned only by play on the field. Nor is the honor of wearing the captain’s armband, which Solo was given in a match last month despite the charges against her. That’s especially so considering how many children will be watching Solo during World Cup qualifying and in the tournament itself. Of course, children watch the NFL as well, but American soccer appeals more to young girls than perhaps any other sport. The message being sent here is that behavior is important but winning is more important than behavior. That flies in the face of the lessons being taught by every youth soccer coach in America. It really would not have been that hard to send a better message here. Even sitting Solo for a single qualifying match likely would not have cost the team its shot at the World Cup. Solo would have been able to return to the team after that suspension and perhaps extend her U.S. record of 73 shutouts. Even that punishment would not have fit the alleged crime, but something meaningful could have been achieved without affecting legal due process or the overall on-field welfare of the team. Instead, the focus will remain on Ellis’ decision and Solo’s actions. Time spent telling stories about Alex Morgan and Abby Wambach will be chiseled away by time spent debating Solo’s status. Is domestic violence against a 17-year-old as bad as domestic violence against an intimate partner or a child? That question has been asked many times over recent weeks. The more urgent question is: What can we do as a society to prevent adults from striking helpless people? The answers: punishment and counseling. Solo deserves the former and needs the latter. And she wouldn’t even be the first American Olympic hero to face her demons this week. Michael Phelps was suspended Monday by USA Swimming after he was arrested for drunken driving earlier this month. Phelps, to his credit, announced he was entering a six-week, in-patient program in response to his personal struggles. A temporary ban and some form of therapy would be a good recourse in Solo’s situation as well. Instead, she’ll stay on the field and get cheered by little boys and girls who would probably be taken out of the stadium by their parents if they so much as slapped their sibling on the arm. What Ellis and U.S. Soccer have failed to realize is that “winning is the only thing” doesn’t really work anymore. A national discussion about safety has begun, and instead of the U.S. women’s national team being in the lead, it’s way in the back. That’s a disservice to Solo’s teammates, who have done nothing wrong, and the sport itself, which grew rapidly in national esteem over the summer with the U.S. men at the World Cup in Brazil. The women’s national team has been one of the most brilliant parts of the sports landscape over the past 15 years, ever since that unforgettable Rose Bowl moment in 1999 when a Women's World Cup was clinched and a nation was smitten with Girl Power. There was another chance to show some Girl Power on Monday. This time, however, U.S. Soccer whiffed.